Saracens are back at the top of the Premiership, London Irish are further away from safety at the bottom of the table and Bath get the better of Gloucester at Kingsholm in the West Country derby. It's been an eventful Easter Saturday of Premiership rugby action. Remember, chocolate is not the only thing to gorge on tomorrow as we are back for another paced day of live text commentaries from 14:45 GMT. And, as always, we'll have live text and radio commentary on every single one for you to tuck into from around 14:45 GMT. Worcester Warriors all but ended their Premiership relegation fears with an uninspiring victory over error-strewn bottom-of-the-table side London Irish. Two Tom Heathcote penalties gave Warriors an interval lead as the Exiles wasted several promising situations. The pattern continued after the break with Blair Cowan and Ciaran Hearn dropping the ball when set to cross. Heathcote added two kicks but Irish, who lost Topsy Ojo to injury, earned a losing bonus point through Greig Tonks. Two second-half tries gave Bath a narrow victory over local rivals Gloucester at Kingsholm. Semesa Rokoduguni's great finish put Bath in front before Laidlaw levelled the scores with his fourth penalty. George Ford missed a penalty to put the visitors ahead, but Levi Douglas' late score secured a hard-fought win. England's Owen Farrell led Saracens back to the top of the Premiership with a masterful display in a bonus-point victory over pre-match leaders Exeter. Despite facing a strong wind, a Sarries side boosted by five returning England stars bossed the first half, with Alex Goode and Billy Vunipola crossing. Two Gareth Steenson penalties made it 12-6 at the break. But Farrell's fine try and scores by Jackson Wray and Chris Wyles sealed the win despite Thomas Waldrom's two tries. Worcester come up with their fourth successive Premiership win and that is a record for this club in their 10 campaigns at this level. London Irish simply did everything to lose it, Blair Cowan and Ciaran Hearn were most guilty as they fumbled two huge chances. A losing bonus point is scant consolation. London Irish want something from this game and with their next penalty, Greig Tonks quickly points to the sticks. And he lands it. Losing bonus point back on the table for the league's bottom side. Tom Heathcote with his fourth penalty for Worcester and that does no more than take the losing bonus point away from London Irish. Cruel, that with less that four minutes remaining. Huge push from Worcester, the rolling maul comes short, but they edge closer. Penalty for Worcester. Decision to be made. Go for the sticks or kick for the corner? The full-time whistle goes and Bath see out the victory in the West Country derby at Kingsholm. 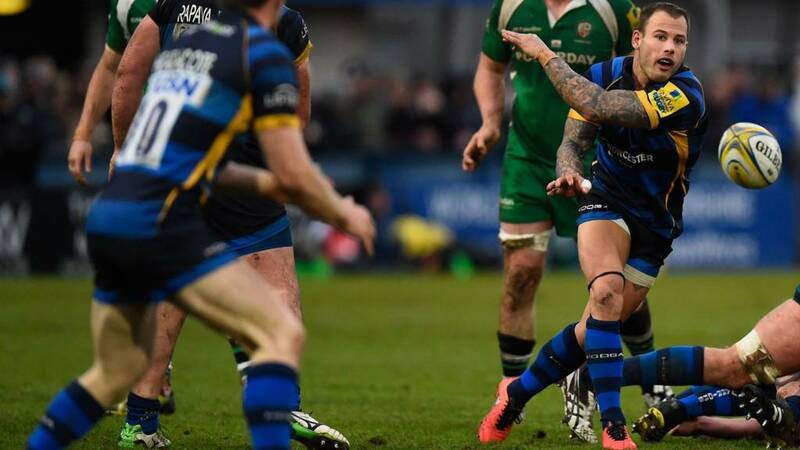 Worcester's Francois Hougaard is bumped into the advertising boards pitchside by Blair Cowan. Anything really in it? Not really, just a bit of bravado and push and shove. Referee blows for the penalty, no cards. Bath get a scrum five metres out from the Gloucester line. A bundle of bodies is driven over the line and Levi Douglas is given the credit for the try after a great run from Semesa Rokoduguni. George Ford misses the conversion. It has not been his day from the boot. Just three minutes remain at Kingsholm. Greig Tonks lands the points at the end of the most controlled passage of play from London Irish. Fluid attack from the Exiles starts down the left through Sean Maitland and Theo Brophy Clews. Patiently, yes patiently, they go through the phases and Ciaran Hearn comes up with a elusive step inside before being taken down. Penalty. Following a stray pass on the right edge - and after mopping up in defence once Francois Hougaard set Worcester off on a break - the ball criss-crosses the field as London Irish try to get something going from deep in their own territory. It doesn't come. Greg Tonks punts up field, and territory is gained that way. Points have been hard to come by in the second half but Bath get an opportunity after winning a penalty at the scrum. George Ford, having already missed a penalty and a conversion today, backs himself. He's five metres in from the touchline and about 30 metres out from goal. But the England man doesn't have the distance as his effort falls short of the posts. There are about nine minutes remaining at Kingsholm. Feisty are scum-halves. Warriors' Francois Hougaard forces the turn over after harassing Scott Steele. The set-piece breaks up and the scrum is set again with the Warriors feeding the ball. The Worcester full-back pumps those speedy little legs and has the home crowd in full voice. Great break, this game may have a try in it yet. Oh wait, no. No, dropped ball and the attack is over. Dazzling stuff, it must be said as the hosts dash 70 metres down field. London Irish in that oh so familiar position. With guts and determination that move to within sight of the try line. Toot, penalty. Pressure off and Worcester set the scrum. As you were, one and all. Less than 20 minutes to go in the West Country and Bath have blown a good attacking opportunity. Their line-out throw just outside the Gloucester 22 is not straight and they concede a scrum. It's fairly nervy at Kingsholm. Defeat by a thousand lashes, this. Tom Heathcote lands his third penalty of the game for Worcester. Those missed chances for London Irish looking increasingly grizzly.